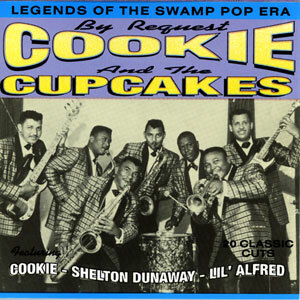 Cookie and the Cupcakes are an American “swamp pop” band from south Louisiana, best known for their 1959 hit “Mathilda.” “Swamp pop” is a Louisiana hybrid of rhythm and blues and early rock and roll with Cajun music and zydeco, with soulful singing. The band were originally led by Huey “Cookie” Thierry (1936-1997), who was born near Jennings, Louisiana. He formed the band around 1953, originally as The Boogie Ramblers, and shared lead vocals and tenor sax with Shelton Dunaway. Other original members were Sidney “Hot Rod” Reynaud (tenor sax, Marshall Leday(guitar), Ernest Jacobs (piano), Joe “Blue” Landry (bass) and Ivory Jackson (drums). The band was based in Lake Charles, Louisiana. In 1955 The Boogie Ramblers released “Cindy Lou” and “Such As Love.” They became a popular regional live act, and toured with big names like Jerry Lee Lewis and Fats Domino. After a serious car accident in 1964, “Cookie” Thierry moved away to California, and was replaced as lead singer by “Little Alfred” (or “Lil’ Alfred”) Babino. With Ernest Jacobs as bandleader, the group continued for several years but dispersed in the early 1970s. Thierry was rediscovered in the 1990s and played at occasional blues festivals, reunited with the rest of the band, until his death in 1997. Thereafter, the band, led by Lil’ Alfred, continued to perform at clubs in Louisiana and southeast Texas. Babino died at his residence in Lake Charles, LA in 2006.